Duo or a trio acts is always impressive. Thunderbolt and Lightfoot is a duo act but not just any duo but a folk duo. "Let's Be Friends", is the track most recent by the duo. The only other track that has taken a similar name is "Just Be Friends" by a virtual pop vocaloid Luka Megurine from the company Crypton Future Media out of Japan. While the two acts are completely different in genre, it is quite amusing to the titles of their tracks being similar if only slightly. 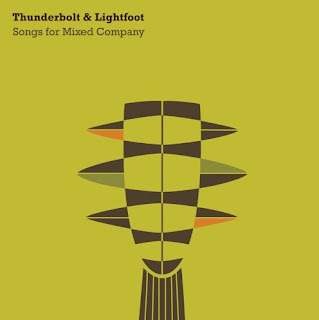 In the case of Thunderbelt and Lightfoot's "Let's Be Friends", track though, it is a folk acoustic track that takes the reign of sounding decent enough. Folk music for anyone is a type of genre that can be accepted or rejected varying on the person listening in. For me listening in to folk on and off for a while, hearing it coming from this duo act was pleasant. The track was smooth, soft, and comforting to the ears with its music gliding through. Whereas the vocalization coming from the duo themselves, had them singing in tune with one another, each taking part in singing their share of the lyrics, had them sounding crisp and clean as possible. All the lyrics of the song could be heard clear as a bell. Whilst the content of the track was right, detailing of a relationship gone wrong, having the situation settle off to being just friends for the sake of it. Not so bad of lyrics, let alone meaning for a song to have, as a lot of acts from all genres, have songs revolving around love, romance, relationships, family or friends, if not other similar content altogether. In this case, this topic of choice for Thunderbelt and Lightfoot felt right and made the right moves with the music's melody choices. The song was very uplifting, sounding more as a ballad type of acoustic folk track than anything else. It also appeared to be quite short when it was not the case for it. It just gives off that sense to it though, it sounds like you just heard it starting to hearing it ending right away. This not being a bad thing at all or a good thing more of a in the middle thing. When it comes down it really, Thunderbolt and Lightfoot is a duo of sorts that has taken the folk genre to another level of abilities for the act. Their material always sounding so much alike, this track tended to sway away from the usual source material, to sounding much more grounded and well rounded off. It really plays off to being a type of track you could see be used in a comforting scene of a film or TV scenario. It has all of the making's to do such a thing. That is what Thunderbolt and Lightfoot does with their music, they give off emotions that can interject with your own life's problems and issues of emotion. You can express it all just within a track simply titled "Let's Be Friends".